Preheat the oven to 425°F. Line a cookie sheet with parchment paper. Unroll both pie crusts and square the edges of each. Cut each crust into four rectangles. Place 1 teaspoon of jam in the center of a rectangle and top with another piece of crust. Crimp edges to seal. Combine dough scraps and roll them out, again squaring edges to form more rectangles. Repeat until all of the pie crust is used. Bake pop tarts 7 to 8 minutes or until slightly brown. Allow the pop tarts to cool for 5 minutes. Meanwhile prepare glaze by adding milk to the sugar, 1 teaspoon at a time until the desired consistency is reached. 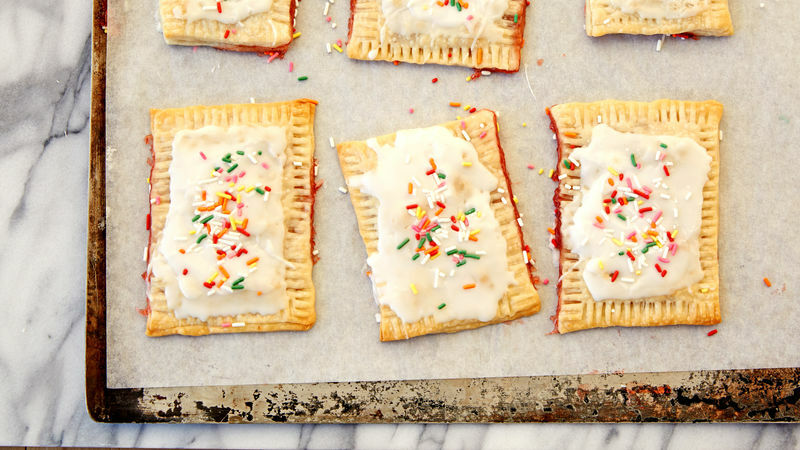 Pour glaze over the pop tarts and sprinkle with decorating sugar. Serve warm. Pop tarts are good. Homemade pop tarts are better. This recipe for your favorite childhood breakfast (okay, treat), is five stars and only requires four ingredients, so there’s really no reason not to make it! We used strawberry jam preserves, but like your favorite pop tarts, you can experiment with flavors and filling. Cherry, blueberry, and raspberry jam make for delicious alternatives to the strawberry filling. And dare we might suggest filling your homemade pop tarts with Nutella? We used rainbow sprinkles for our version of these sweet treats, but you could also drizzle with chocolate syrup (if you’re eating them right away!) or add chopped fruit to the top. If you’re hoping to have leftovers, we suggest spreading the glaze and sprinkles on the pastry and allowing it to set before storing. If you decide to try an alternative topping like chopped fruit or syrup, add them right before eating. Once you try these homemade pastries, you’ll want to try making all of your pastries at home.